In March of 2015, I was in Nashville for the National BBQ Association's annual conference and staying at the Sheraton Music City Hotel. 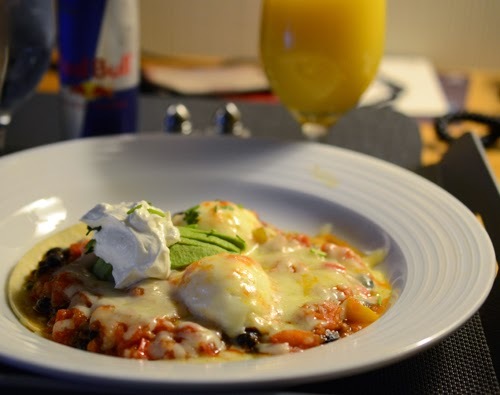 It was snowing out so I got room service and was surprised to get some of the best huevos rancheros I have ever had. 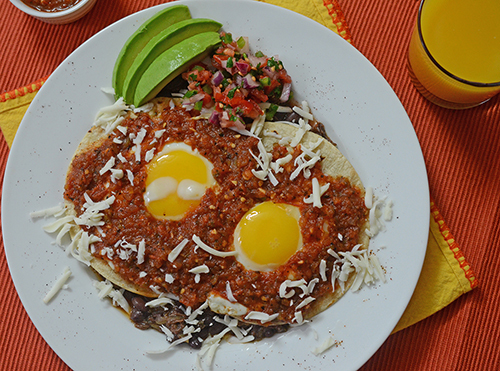 The huevos rancheros in question. They used poached eggs and 3 chile black beans were in the mix. It was amazingly good, way better than you'd ever expect from room service. That dish stuck with me and I finally got around to making a version of it this weekend when I had some leftover brisket from a community service event that we cooked for last Thursday. 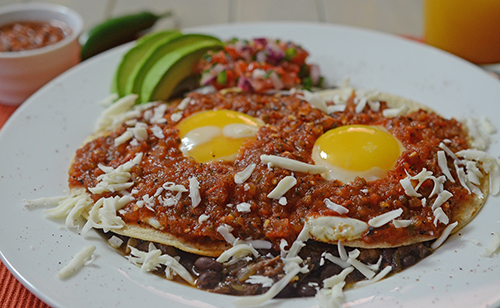 Because what would go better under huevos rancheros than 3 chile black beans? How about a black bean, chile, and brisket chili!?! Spicy black bean and chopped brisket chile topped with crispy grilled tortillas, fried eggs, and Oaxaca cheese all smothered with homemade fire roasted salsa. 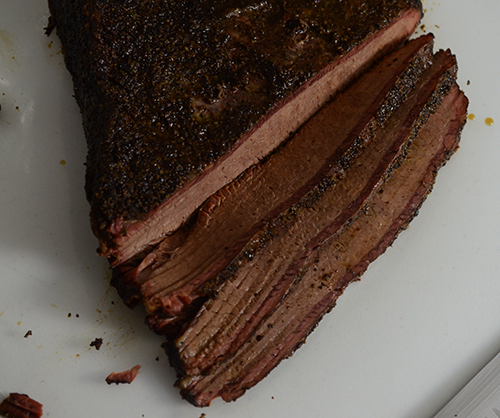 If you don't have leftover chopped brisket, you can always buy some from your local BBQ joint. Preheat grill to 350f (medium). Mix all chili ingredients together in a grill safe pot. Place on grill and allow to simmer for 30 minutes. (Alternate method using raw chiles and onion: Just dice the onion and chiles, then saute in a pot over medium high heat until tender, 8-10 minutes. Add in remaining chili ingredients and simmer for 30 minutes. 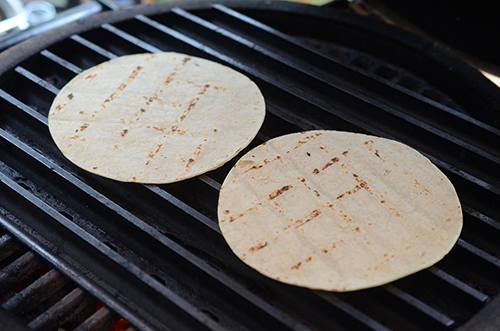 Grill tortillas until crispy, about 1 minute a side. Wrap in foil and keep warm. Fry eggs sunny side up (or to your preference). Place a cup of the brisket and black bean chili on a plate. Top with two of the tortillas and two eggs. Smother the eggs with salsa and serve with pico de gallo, crema, and avocado on the side. Repeat for other 3 plates. It might be difficult to find the Oaxaca cheese but it's worth it if you can find it. I call it "Mexican mozzarella" because it is rich, buttery, and melts like a dream. We buy ours at Kroger or Walmart in the refrigerated Latino foods section in the Dairy department. I had leftover brisket because we cooked for a community event. I brought the "Warthog" stick burner out of storage for this one. 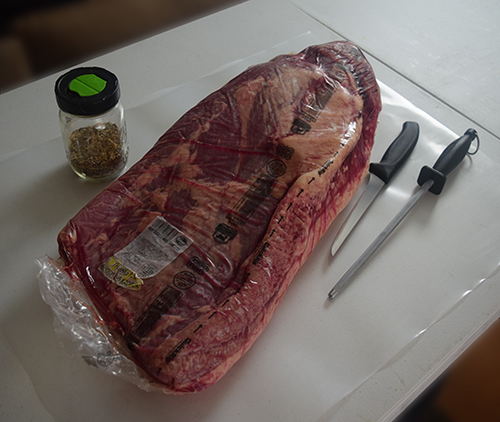 Huge 18 lb Certified Angus Beef brisket that we bought from Kroger. I wish that we had a regular, consistent source for CAB briskets in Knoxville because the last 2 we have gotten were very nice. 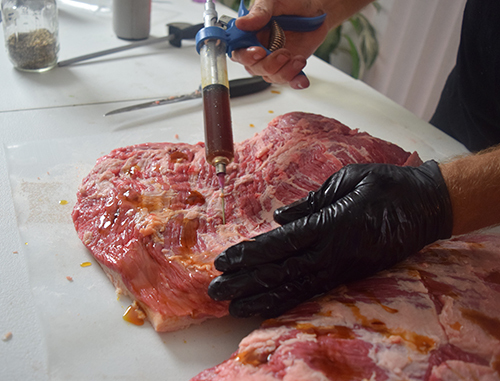 I injected using Butcher's Original Brisket Injection. I switched from the Chops Power Injector to this type of injector because I like that it applies metered doses instead of guessing how much I have injected. Each squeeze of the hand grip is 1 to 5 cc, depending on the settings. This way I am injecting a consistent amount everywhere. You probably noticed that I separated the point and the flat. 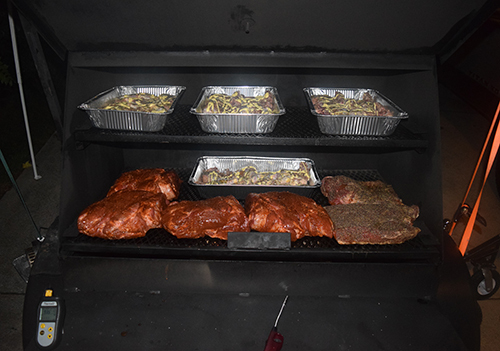 We do this at competitions, mainly because it cooks quicker, more evenly, and it gets me better bark coverage for my burnt ends. 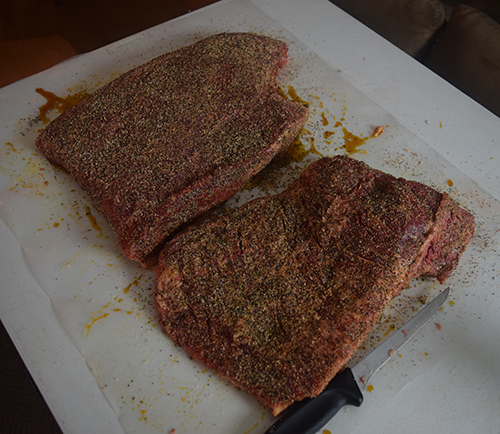 Here's a great video by David Bouska of Butcher's BBQ about how to trim this yourself. I used a dalmation rub (salt, pepper, garlic, red pepper). 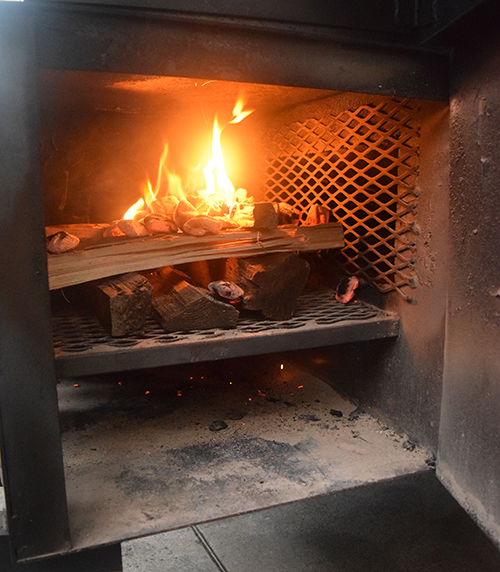 To get the Warthog going, I do about 6 small, cross-stacked splits of hickory or oak and use a shovel to put about a half chimney starter of live charcoal briquettes on top of the splits. Then I open up the intake vents and exhaust ports full bore to get the air flowing. 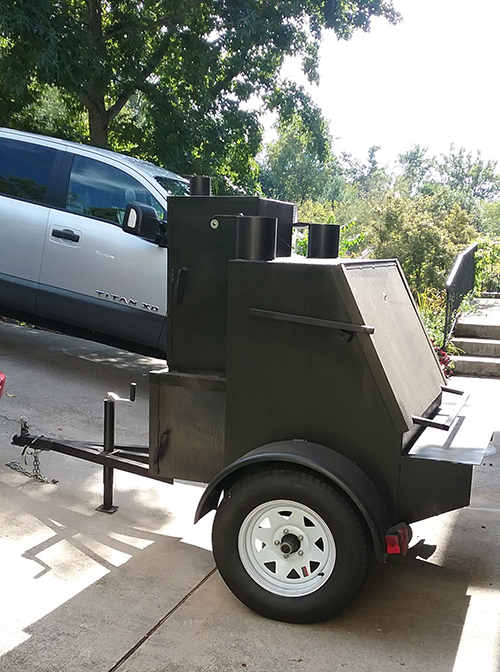 We cooked roughly 50 lbs of chicken, 40 lbs of pork, and 20 lbs of brisket for the event, which is why I used the stick burner. This was in addition to vacuum sealed freezer packs of pork and beef that we had from previous competitions. We were anticipating 100 guests and had enough food for 150 guests. That's why we ended up with extra, which is a good problem to have. Sure beats the alternative. This is the leftover part of the flat heated back up for the eggs. To reheat brisket I wrap it in foil with about 1/3 cup of beef stock and put it in a 250f oven for 45 minutes to an hour, just until it gets flexible again. 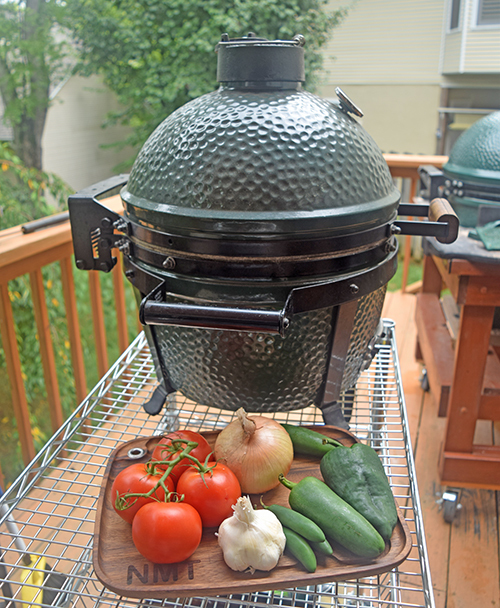 I grilled the veggies for the black bean and brisket chili on my Big Green Egg Mini-Max. It's perfect for small jobs like this. 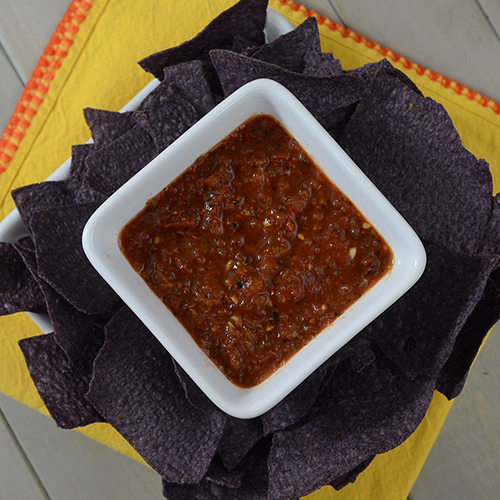 My recipe for homemade fire roasted salsa is my most recent post. I grilled the corn tortillas to get them crispy, about 30 seconds per side at 350f. Breakfast, brunch, lunch, or dinner, this meal is a winner. I like making the salsa, chili, and pico de gallo ahead of time so all I have to do is toast some tortillas and fry some eggs. [FTC Standard Disclaimer] I received no compensation for this post. I have no affiliation with Sheraton, Big Green Egg, or Butcher's BBQ. I have a good relationship with Certified Angus Beef but have received no benefits or compensation from then this year.